Add an elegant touch to your kitchen with a unique and versatile undermount sink from Kraus. Stainless steel sink is a great centerpiece for any kitchen remodeling project. Kraus kitchen sink boasts 16-gauge premium grade T-304 stainless steel construction with an 18/10 chromium/nickel composition. 23 In. Undermount Single Bowl 16 gauge Stainless Steel Kitchen Sink Add an elegant touch to your kitchen with a unique and versatile undermount sink from Kraus. Stainless steel sink is a great centerpiece for any kitchen remodeling project. Kraus kitchen sink boasts 16-gauge premium grade T-304 stainless steel construction with an 18/10 chromium/nickel composition. 23 In. 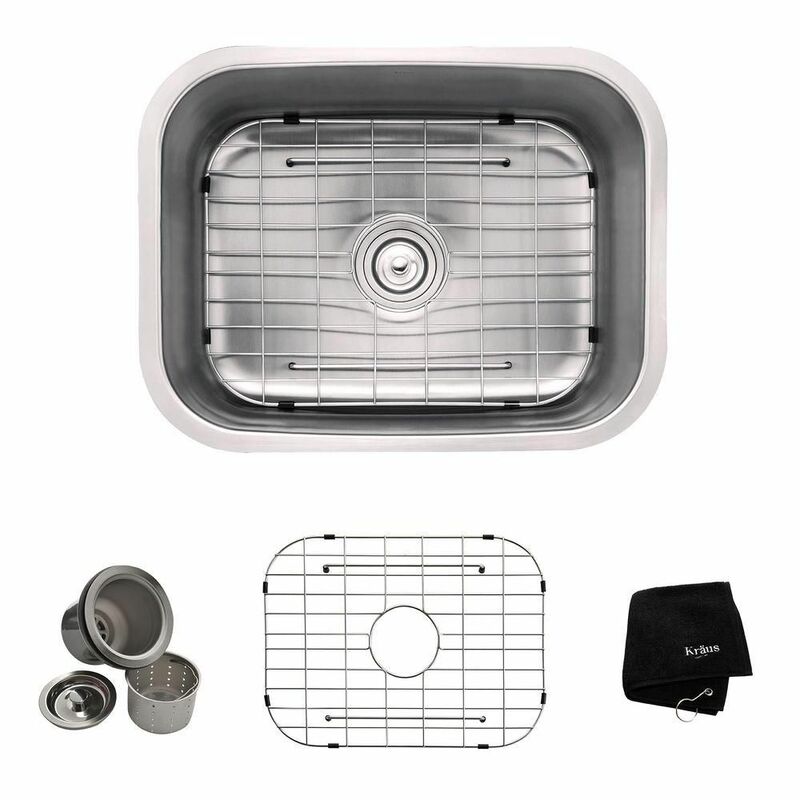 Undermount Single Bowl 16 gauge Stainless Steel Kitchen Sink is rated 4.8 out of 5 by 102. Rated 5 out of 5 by Lynn from It did. I loved it so much I’m returning for... It did. I loved it so much I’m returning for a bigger size. Rated 5 out of 5 by Vicki from Better quality than what was available in store and at... Better quality than what was available in store and at a better price. Complete with drain and rack! Rated 2 out of 5 by RG from Sink came with a dent. ... Sink came with a dent. Rated 5 out of 5 by Charlie from Perfect for where I needed it. Perfect for where I needed it. Rated 5 out of 5 by Jesse from Packaged well. Installed with ease. I would order again.... Packaged well. Installed with ease. I would order again. Rated 5 out of 5 by HomeDepotCustomer from Love it! ... Love it! Rated 5 out of 5 by Olga from Loved everything about this sink.The quality is top notch.The little... Loved everything about this sink.The quality is top notch.The little basket used to catch food particles is creative.The deep sink is perfect. Rated 4 out of 5 by Eugene from good quality, but did not fit my garbage disposal, so... good quality, but did not fit my garbage disposal, so basket was useless. Delivery was fast and sink is very good quality.